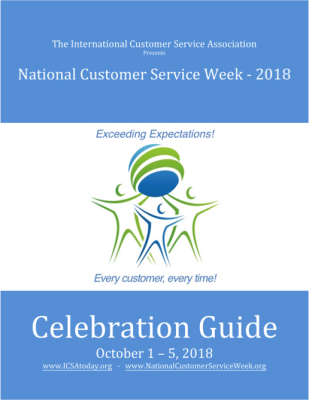 National Customer Service Week 2018 is the first full week of October. Beginning Monday, October 1st and running through Friday, October 5th, each day of NCSW will have it's own unique mini-theme as listed below. Kick off NCSW by making sure EVERYONE in your organization knows it is National Customer Service Week. How? Total company email. Total company huddle. On your organization intranet. Any way you can, let everyone know you are celebrating National Customer Service Week and your Customer Service Professionals! Okay Executives...it's YOUR turn to service customers! Take on the role of Customer Service Rep! Take calls; answer questions; maybe even handle a complaint! Don't worry about navigating the system. One of your real Customer Service Pros can drive that for you while YOU take care of the Customer! Who doesn't like to eat?! Today, treat your Customer Service Professionals to a wonderful lunch served by Managers, Directors, VPs, and Top Management! And while you are serving up the chow...serve up the thanks to the folks who take great care of your customers! Dress up....encourage your Customer Service team to dress to impress! Or, if your work environment is already dressed up - make it a dress down day! Other options include dressing in the television or movie character of your choice...or wearing your favorite team colors. Get creative and have fun! On the final day of NCSW devote your celebration to giving out awards and recognition to your Customer Service Professionals! Tip: Recognize EVERYONE! Award the Champions! And make sure everyone in the company knows who is being recognized! We've even seen organizations use their website to recognize their Service Stars!